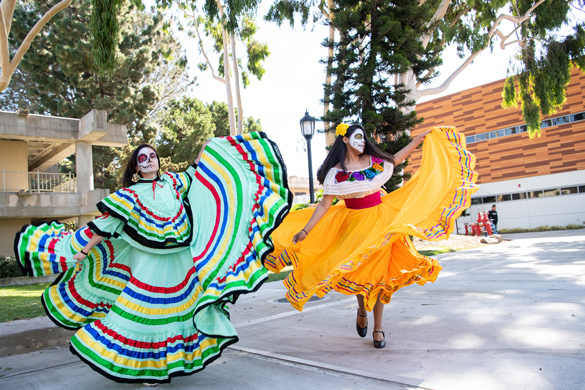 Hundreds of students, faculty, and staff celebrated Dia De Los Muertos at the Student Services Center North patio on November 1, 2018. 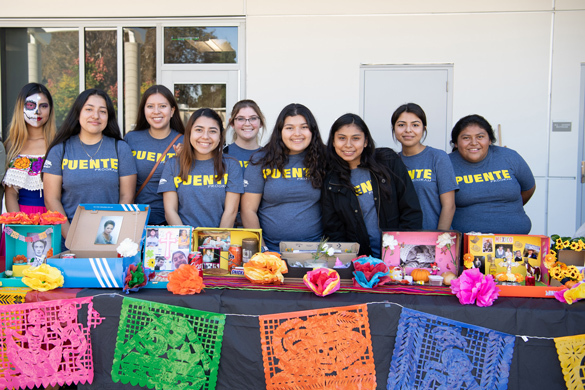 The exciting event, hosted by Puente and Intercultural Programs (ICP), featured a day of cultural learning, dance and music, crafts, food and festivities. Beautifully crafted ofrendas (altars), created by Puente students and GWC’s campus community were on display. Attendees were encouraged to make their own ofrendas to honor the dead, craft papel picados (decorative paper cut into elaborate designs), and decorate sugar skulls. Resources were available to educate the campus about the cultural and historical background of the holiday. GWC’s Cosmetology Club provided festive and colorful face painting for attendees. Entertainment included an original song performed by the GWC Beats Club, a spirited indigenous dance, and a performance by GWC’s Folklorico Club in a traditional dance style from Jalisco Mexico.